This is part 3 in my series on show, don't tell (SDT). If you're just joining us, here's part 1, on converting scenes into summaries, and part 2, on presenting facts, not conclusions. The previous two articles looked at SDT on a small scale, within individual scenes. But quite often we need to show things at a larger scale. Notably, while the plot is busy unfolding, we need to create and show our characters undergoing their own personal growth and change too. We need to show the character arcs. At the beginning, a tragedy happens causing him to develop a fear of heights. In the middle, this fear causes him problems in various situations, though he fights it. At the end, he overcomes his fear in order to handle the story's big climax. To build such an arc, we're going to need a scene at the beginning to establish his fear, some scenes in the middle that show him fighting against the fear (and mostly failing), and of course a climax scene that involves a high place. Let's take step one of the arc as an example. And since that picture is so outdoorsy, let's make the character a National Park ranger. Let's call him Wayne Mattock. That's a good, manly park ranger name. Wayne's out making the rounds in Yosemite National Park, when he comes upon a bunch of excited tourists all agitated and pointing towards a young man who has walked out to a cliff's edge. Wayne goes out to drag him away from the ledge, and discovers that the young man--let's call him Charles--is distraught. Wayne is cool and collected. He's had training in talking jumpers off of ledges. Comes with the territory in a park like Yosemite. He engages the man in conversation, working to gain his trust. Wayne assessed Charles' posture and his face. His stance was softer. His eyes had lost their wild edge, indicating that he was calmer now. Wayne had established trust with this kid, which meant he could now use that trust to bring the boy to safety. Wayne reached out a hand. "Come on, son. Let's go back to my truck. I've got some sodas in the cooler." All of a sudden, Charles flashed into anger again. "Screw you! I've ruined things with the only woman I'll ever love, lost her forever, and you think a soda's going to fix it?" He swung wildly to knock Wayne's hand away, and stepped backwards, meaning to end it all. "Kid, no!" Wayne exclaimed and lunged forward. He caught hold of the boy's sleeve to pull him back just as Charles' foot stepped out into nothingness. Wayne yanked, but gravity was too strong and the loose soil underfoot too weak, so Wayne was pulled forward as Charles tumbled backwards into the abyss. Wayne tried to throw himself back, letting go of the poor kid's sleeve, but it was no good. He gyrated around, reaching wildly for anything solid as the ground ended below him. He just managed to cup a hand over a lip of rock, which arrested his fall, though his body slammed thunderously into the cliff face. He hung there, stunned, holding on so he wouldn't drop. The screams of the crowd reached him just in time to muffle the sound of Charles breaking against the rocks below. The boy was dead. Wayne squeezed his eyes tight with terror, not daring to look down. The next thing he knew he was sitting in his truck, with no memory of how he'd climbed back up. No memory of pushing his way through the crowd of tourists who now mobbed around him. He must have blacked out. He could not bring himself to look to the side, towards the cliff that had so nearly ended him. Wayne would now carry a fear of heights with him for the rest of his life. I see stuff like that all the time. All the highlighted parts in that passage are where the author oh-so-helpfully points out the larger meaning of what's happening. As though readers weren't smart enough to figure those things out. When I read stuff like "the boy was dead," after a sequence of events for which that is both the obvious and the only reasonable conclusion, it makes me mutter "Oh, gee, ya think?" What are all those explanations doing in there but cluttering things up, slowing down the pacing of the scene, and conveying the solid message that this writer doesn't trust the reader to be smarter than a sack of wet socks? All that author-interpretation can go. Re-read the passage, skipping over the highlighted parts, and see if you don't think it reads more smoothly. Relative to the character arc, that last highlighted line is the problem. It tells the reader the meaning, in terms of Wayne's larger life, of the events we just read. It leaves no room for the reader to think, on their own, "Hey, I'll bet Wayne's not going to want to go near any cliffs for a while." The bigger-picture view of the scenes in your story is that they are events and experiences, which as a whole, convey lessons and meaning. Leave the events and experiences on the page. That's what readers want and need to see. But leave the lessons and meaning out of it. In Wayne's character arc, the above scene is not there to 100% convince readers that Wayne is now afraid of heights. It is only there to set up the possibility that he may be afraid of heights. In fact, it's best if the writer doesn't say anything about such fears at all. Just leave the raw experience there on the page, and move on to the next scene. The reason why is because of what happens in the next part of Wayne's arc: where this new fear will start to cause him problems. Think about it: in the immediate aftermath of the above scene, does Wayne himself know that he now has acrophobia? Probably not. He's probably not going to realize it until the next time he's confronted with a height, and surprise!, finds that he can't handle it. Thus, shoving that into the narrative is both ham-fisted and premature. When Wayne is confronted with that surprise, even if it's a hundred pages later, readers will immediately connect it back to the earlier tragedy of Charles' death and Wayne's own near-death experience. They will do that because they understood the deeper meaning of the earlier scene, even if all those horrible highlighted parts weren't there. Readers are smart. You can trust them to connect the dots. When they see a later scene in which Wayne can't bring himself to step out onto a bridge or climb a fire-lookout tower or whatever it might be, they will understand that he has developed a fear of heights. You need not explain it. In fact, it's better if you don't. Wayne stood at the base of the lookout tower, rooted in place while watching Evelyn climb the worn wooden stairs above him. The tower was tall. Much taller than he'd imagined it would be. "C'mon up," Evelyn called down. "The view's amazing." "Yeah," Wayne stammered. "Hold on. I'll be right up. I just--" He looked up at the dizzying line of steps leading to the tower's top and tried again to mount the staircase. He found he could not. His foot simply would not move. Would not lift up onto that first stair. He walked a few steps away, rubbed his face, and came back. No good. Cold sweat slicked his palms while his heart raced. He simply could not do it, because he had developed an intense fear of heights after his near-death experience at Yosemite. If you give a reader this, they're going to hit that last line and have their own "Oh, gee, ya think?" moment. Here's the thing about readers being smart: you may think you're leading them up to some surprising revelation, and can therefore use an explicit author-interpretation line to hit them with the big dun-Dun-DUNNNN. But chances are, the reader got there ahead of you, so your little bit of interpretation only ends up making you look slow. Never tell readers what anything means. Give them the events. Show them the experiences. But let them do the rest. Writing ultimately only works because of trust. 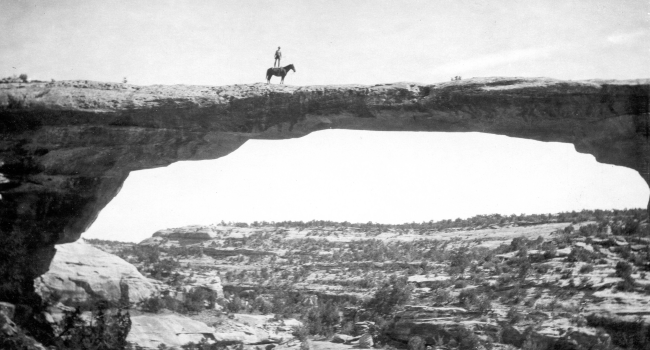 Your readers start your book with trust: they're trusting you to give them a good story experience just like that horse in that picture trusts the rider not to lead them both off the edge of that stone bridge. And likewise, you need to trust your reader to take the deeper meaning of your story's events just like the rider trusts the horse not to bolt while he's standing up there. And they will. Readers are smart. So long as you show them the events and experiences, they'll find the lessons and meaning. When the story's climax shows Wayne getting the job done despite being set in a high place, they'll know it means Wayne has come to terms with his fear. They'll understand that his arc has come to a satisfying conclusion, without you saying one word about it. Trust in your readers as they trust in you, and all will be well. Come back next week, when we'll look at how SDT connects the visible and invisible elements of your story.